Do you like to scrapbook but can't find the time? Do you love to craft with friends? Here is an easy way to scrapbook once a month and budget your purchases! Consider starting a club with your friends! My StampinHeaven Hostess Clubs consists of 6 club members that commit to spending a minimum of $25 each month for 6 months. Each month we use the Workshop Your Way Kits which includes 3 two-page layouts. Orders are placed on club night for the following club date. The $25 minimum counts towards the kits we do - Workshop Your Way kits are $27.95 and includes EVERYTHING you need to complete the 3 layouts. Do I have to do the kit? NO!! If you choose not to order the kit we will be doing, then you just need to place a minimum of $25 order on any other CTMH products to meet the minimum club commitment. Where do clubs meet? 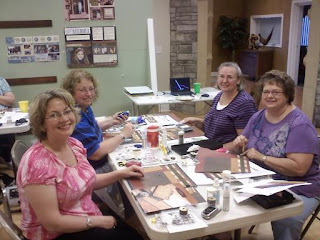 Clubs can either meet at my home (I have a large workshop area) or they can choose to host at the Hostess' homes! Some of my hostess love to host club night at their homes on the night they are hostess. Others love to take advantage of my space and not have to worry about cleaning up for guests! What are the benefits of being in a Hostess Club? There are many benefits! Gives you more hands-on with your scrapbooking tools. Familiarize yourself with the wonderful How-To books designed by Close To My Heart. Receive instructions to create layouts that are NOT published in any of the How-To books. Consultant to instruct and assist you. Day/Night out with the girls! Help you slowly build your supplies without breaking the bank! Each Hostess is guaranteed at LEAST $25 in FREE products! FREE catalog/idea book for as long as you are a member of club. EARLY notice of all specials! My clubs run March - August for Spring/Summer and September - February for Fall/Winter. I will be happy to add additional clubs during the the month. Contact me today!